On a lazy weekend morning, a friend and I decided to treat ourselves to an indulgent breakfast and headed to West End. The Gunshop was our destination. This popular restaurant is located right across the street from The Three Monkeys and is a haunt for those in search of fresh, unique dishes. As I mentioned it was a lazy morning, so it turns out we were too late for breakfast (they stop serving it after 11am) and had to settle for lunch. I ordered tempura coated zucchini flowers, filled with roast pumpkin and goats cheese, which came covered in rucola and cherry tomatoes, drizzled in a balsamic dressing. Unfortunately (or fortunately perhaps) the menu is constantly changing, and as I write this I can see online that the menu no longer features my beloved zucchini dish. They have a range of 'Gunshop Classics', one of which my fellow diner ordered; the Warm Tasmanian Lamb Salad. It was elaborately presented, and apparently amazing. Both the dishes were satisfying but we were feeling greedy and couldn't go past the delicious looking dessert menu. I had the flourless chocolate cake while my friend had the coconut cream panacotta, served with pineapple compote and ginger crumbs. Again, both were delicious, although we decided based on this instance that my ordering skills are superior to his. If you are a chocolate lover you must promise me to try their chocolate cake at some stage. Apart from the great food, The Gunshop's setting in a heritage building is lovely. You will find a cosy indoor area, most likely full of patrons, with tables spilling from the front door onto the sidewalk, as well as a courtyard out the back surrounded by gardens. Their breakfast is well-known, therefore they take no bookings for the most important meal of the day and it is advised to arrive before 9am as you may face a lengthy wait otherwise. Bookings for lunch and dinner are welcome, and a must for Friday and Saturday nights. Why? For breakfast. 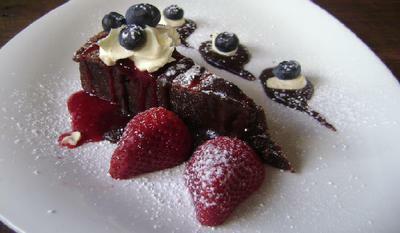 Or if you sleep in, flourless chocolate cake. When: Open every day from 7am. Mondays until 2pm, Tuesday to Saturday until late and Sunday until 12.30pm.